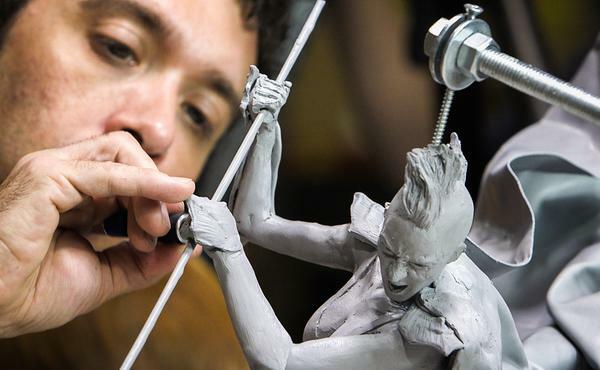 Learn to sculpt detail & accessories for character maquettes with master sculptor Adam Beane, creator of Cx5 armature-free sculpting material. CX5 is an amazing new sculpting material that is really unique and versitile. When cold it behaves like a hard plastic, but when heated it acts like a clay. It can also be worked with hot tools much like you would use for wax sculpting. I picked up a couple packs at Monsterpalooza this year and have been really impressed with it. Has anyone here tried using CX5 yet? I was a little wary when the first course came out as I was not sure if it was more an advertising plug for CX5.. Or a tutorial. Be interested to hear your comments on it. So far I really like it a lot. I've always been a fan of clays that are more firm after cooling. With CX5 the cooled sculpt is super hard which makes it very resilient, and it is amazing at holding fine detail. I don't have to worry as much about handling my sculpt and messing it up. And being able to work without an armature is super cool. You can also mix the hard and soft versions of CX5 to create your own consistency. I have a set of wax carving tools and an alcohol lamp, which works great. Eventually I want to get an electric heated carving tool which will work a lot better. It's something I really want to keep playing with and finding creative uses for. For example you can paint and use pieces that you cast, machine, or sculpt in CX5 without needing to mold them because they are so resilient. Almost like sculpting in an epoxy. Many thanks for your valuable input Chris. It's always great to hear an outside review of an product rather than from the creators/sellers point of view. I suppose what troubled me when I first saw it was that it was the creator.. not a 3rd party demonstrating it's features. Call me cynical but I don't have much money to spend and when I last looked CX5 was fairly expensive. Even more so for shipping overseas. One of the great aspects of the lessons here is that each is taught by one of the best people in the world to teach it. With a unique subject like CX5 there is no better instructor than it's creator, who also happens to be one of the best sculptors I've ever met. I can understand how it may come across as a sales pitch, but he's just the right man for the job. Especially since CX5 has so many unique properties/applications and many of us who have used it are still learning new things every time. It's also an in-demand subject. As someone who is curious about CX5 I've talked with a lot of sculptors here in LA about it (including some who have taught lessons here) and they have all really liked the material. The price point does mean it's not something I'll be sculpting large busts out of any time soon, but thankfully it can be melted and reused. Everything I've ever made in CX5 has been melted down and used again without any negative impact on the material. Maybe some day I'll sculpt something nice enough to keep! I agree it does look like a fascinating product. Personally I can already see a couple of idea's for how I could use it..
Also nice to hear that it is resilient to being reused too. I get what why you might be concerned about the course objectives. However, I watched it and didn't see anything you couldn't do with Chavant NSP or Monster clay. With the exception of what he does with fabric, you could create the same sculpture with Super Sculpey. I've seen so many sculpture videos that most of the benefit I get comes more from what the instructor says, than what they do, or what materials they use. I didn't like CX5 at all. I haven't tried the soft version but using 100% hard CX5 is impossible to create anything small with. If you watch any of Adams youtube videos of his past google hangout sessions you'll see that all the participants were struggling with producing details. There is no "clay" stage with the hard version. Once it starts to cool (and it cools super fast) its impossible to work like a clay. You have to have a special touch to create accurate details using hot tools as its like trying to sculpt butter with a hot knife. I invested in a $300 waxer to work with CX5 but I'm not having any luck so I'm actually using the waxer with monster clay. Not sure how soft the CX5-S is. It seems thats what Adam appears to be using in his videos. Another thing that I found annoying about this medium is you have to ensure that you heat up parts of your sculpture in order for new material to adhere properly. In practice its more of a pain than its worth as you have to ensure there are no air pockets when building up new on top of old and you spend a lot of time trying to smooth this medium. If you dont have properly fused parts then limbs will easily crack. I've yet to see a demonstration of how Adam accomplishes the small details in the small faces he sculpted with CX5. Does this latest video demonstrate that in great detail from beginning to end? I actually want to see all the details put into a face that small.